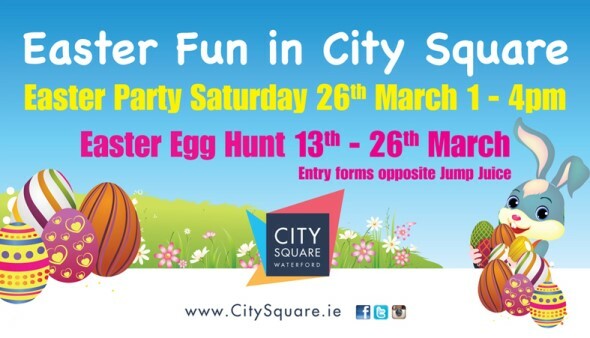 Come join our Easter celebrations at City Square this year with our big Easter Party on Saturday 26th with the Easter Bunny and giant characters. There will be free face painting, lots of eggs and our DJ will have lots of prizes to be won from 1-4pm. We have our annual Easter Egg Hunt throughout the centre but with the year that’s in it we have added a twist. This year the entry form is in Irish as well as English. The entry forms are available opposite Jump Juice. The eggs are located in six different windows / stores around the centre so all children have to do is find the eggs and write down the type of egg in each window. The egg hunt continues until March 26th. There will be 8 Easter Egg Hunt winners. Three will be chosen from those who play on Easter Saturday while five will be chosen from Sunday 13th to Friday 25th March. In addition to getting an entry form in the centre opposite Jump Juice, it’s possible to download them from the this link as well. City Square Shopping Centre is closed on Easter Sunday and will re-open again on Bank Holiday Easter Monday 28th.